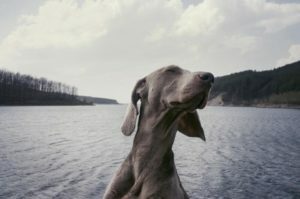 Home » Dog Breeds » Is a Weimaraner Right for You? Weimaraners are noble dogs, best known for their history as large game hunters among German nobility. Their unique coloring and soulful eyes makes them a popular choice among dog owners; but, is a Weimaraner right for you? As a dog from the sporting group, the Weimaraner is stereotypically obedient and friendly, while also bold and fearless. This breed is highly energetic, thanks to its background in hunting large game such as boar and bear. Like most dogs bred to work closely with humans, the Weimaraner is also very affectionate, almost to a fault. Weimaraners are highly prone to developing separation anxiety, and often struggle when left alone. Weimaraners are large dogs, typically topping out at 82 lbs for males and 71 lbs for females. They are known for their uniquely colored coat, which can be blue, grey, or silver grey. Their eyes are light in color, and can be light amber, grey, or blue-grey. The Weimaraner’s coat requires little maintenance, as it is short, smooth, and lies close to the body. This breed does shed, so weekly brushing is recommended. The short coat is not highly insulating, so Weimaraners should wear a jacket during cold months. Weimaraners get along well with other dogs, but they should be monitored around cats or other small animals. Even with socialization it can be difficult for a Weimaraner to ignore its instinctual prey drive. 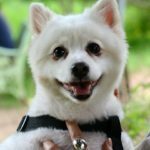 These dogs are known for chasing and killing any small animal that enters the yard, such as squirrels, rabbits, and chipmunks. 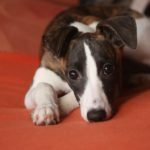 Training is required for this breed in order to help harness the dog’s intelligent and energetic personality. According to pet owners who have registered their Weimaraners with the American Kennel Club, 95% agree that this breed requires obedience training. Weimaraners are prone to experiencing bloat, due to their barrel chest and small waist. Pet owners should take special care when feeding their dogs and follow precautions such as avoiding meals within an hour of exercising and feeding multiple small meals per day instead of a single large one. Vigorous daily exercise is very important for this breed. Without regular activity, Weimaraners can become bored, hyperactive, and destructive. Recommended exercise includes running, hiking, and spirited playtime sessions that highlight the breed’s strengths, such as chasing, retrieving, and following scents. Weimaraners are not good candidates for living in small spaces or houses without a fenced-in yard. Their bouncy and rambunctious personalities, coupled with their large size, makes room to run a requirement unless you are wholly dedicated to long exercise sessions daily. Unlike most purebred dogs, Weimaraners have a low incidence of hip dysplasia. Common health problems include skin allergies and eye disorders, particularly Entropian, Progressive Retinal Atrophy, Distichiasis. 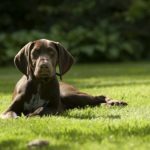 Hormonal balance may be an issue for this breed, and diseases such as Hypothyroidism, Cryptorchidism, and Pituitary Dwarfism may affect Weimaraners at a greater rate than other dogs. Regular preventative veterinary care is highly recommended.